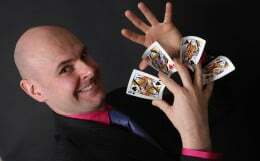 With over a decade of experience, David has formulated an outstanding magical act for corporate events. 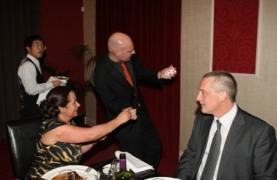 Product launches, business lunches, awards ceremonies and trade fayres are popular venues for his slick sleight-of-hand skills and marvellous feats of mind-reading. Local businesses are frequently mystified by his performances and always ask him back. He has developed a very loyal customer base throughout the Midlands due to his professionalism and dedication to his craft. 1. Amaze your clients with a high-calibre performer. They certainly will not forget your event. 2. Promote your brand image and business reputation in a slick and sophisticated manner. 3. David's likeable personality will instantly appeal to your customers, colleagues and business associates. 4. 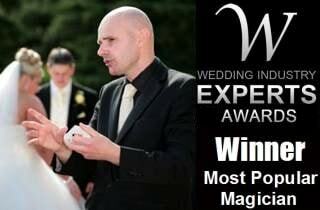 David's 'Magic for Marketing' package can readily be utilised at one of your events. It is designed to entertain but will also cleverly convey the messages you want it to. 5. With thorough planning, advice, determination and commitment, your event will be a grand success with David on board.